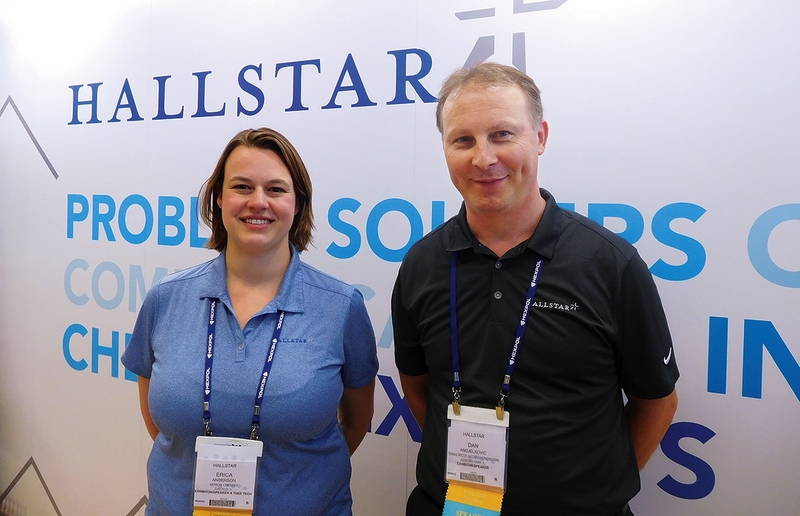 Hallstar’s Erica Anderson, senior chemist for industrial polymers, and Dejan (Dan) Andjekovic, technical director for industrial polymers, represented the firm at the International Elastomer Conference in Cleveland. CLEVELAND—Hallstar, the Chicago-based specialty chemicals company, is helping DuPont achieve new levels of high temperature resistance in its VMX series of ethylene acrylic elastomers through newly developed high-performance ester plasticizers, according to Hallstar executives. Erica Anderson, senior chemist for industrial polymers at Hallstar, presented a paper on these developments at the International Elastomer Conference in Cleveland Oct. 9-12. According to the abstract of Anderson’s paper, ethylene acrylic elastomers are traditionally used in applications requiring performance both in extreme temperatures and when exposed to a variety of fluids. However, the need for performance at ever higher temperatures necessitates the development of new materials to improve on permanence and volatility, it said. “This paper provides information on newly developed plasticizers intended to improve high temperature performance without sacrificing low temperature performance,” it said. According to Anderson, the new plasticizers allow DuPont VMX polymers to perform at temperatures up to 200°C. “This allows for better performance in auto applications that require high heat,” she said. Under-the-hood applications, such as seals, hoses and other parts close to the engine, are the ones for which VMX polymers manufactured with the new Hallstar plasticizers are intended, according to Dejan (Dan) Andjekovic, Hallstar technical director for industrial polymers. Development of the new plasticizers was a joint project with DuPont, according to Anderson. “They provided us with materials and helped us put together an experimental plan,” she said. The work Anderson presented in her paper is just the first part of an ongoing project, according to Andjekovic. “We hope to reveal the results of the second round of testing next year,” he said. Hallstar works directly with its customers to identify their problems and provide solutions, Andjekovic said. “These are proprietary platform projects for long-term market growth,” he said.